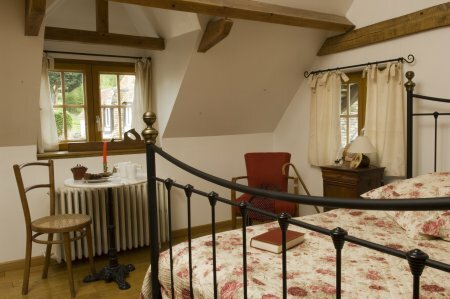 Welcome to Sandrine and Pascal's guest house, a lovely 18th century Norman cottage alongside river "La Levriere". 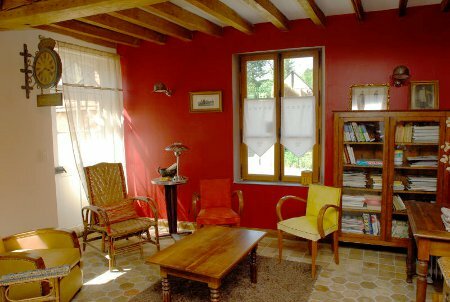 The house is situated in a protected area, close to the historical centre of the village, 35 minutes from Monet's house in Giverny, and 55 minutes from Paris and Rouen. 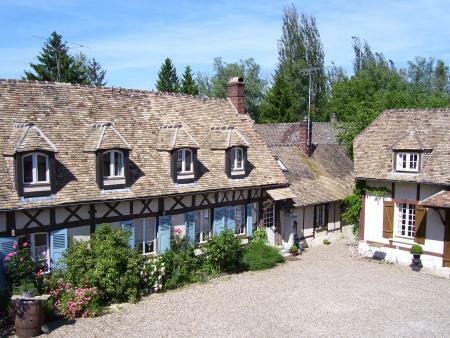 You will be staying in a cosy, charming independant house near the owner's residence, looking out on to the river and its numerous truits and ducks. If you get up early, you may be lucky enough to meet some deer in the 1 ha large garden, walking down to the river. The copious breakfast with home made jelly will be served on the riverside according to season. A living-room with fireplace is at your disposal to enhance your evenings on the countryside, as well as mountain bikes, garden furniture and games for children. Open all year round. and one single bed 90x190cm. Large private bathroom, separate WC. View on garden and river. 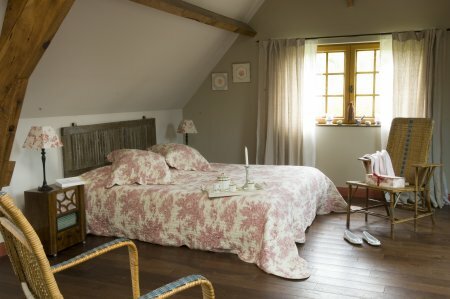 Furnished with antiques from the 19th Century. A large room for 2 people. Double bed 180x200cm. Large private shower room, WC. 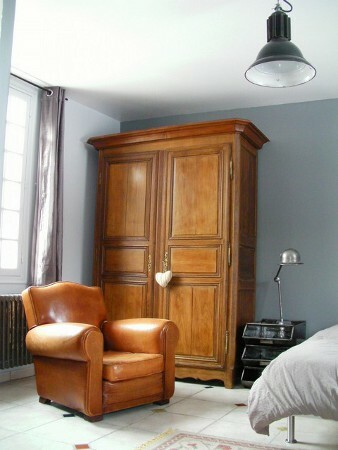 Furnished with antiques from the 19th and 20th Centuries. Note : Clemence of Hungary became Queen of France on August 13th, 1315 when she married Louis X called Le Hutin. 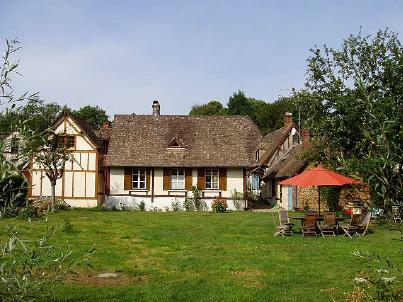 After their wedding, his husband gave her houses and manors in Saint-Denis le Fermans, Hebecourt, Mainneville and the woods of Lyons and Bray. 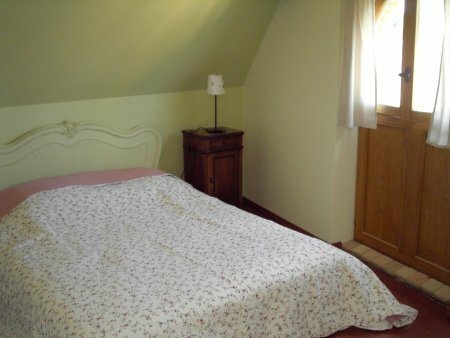 A large room for 3 people, one double bed 160x190cm and one single bed 90x190cm. Note : Blanche of Evreux became Queen of France on January 19th, 1350 when she married Phillipe VI de Valois. She loved walking on the path that goes along Sandrine and Pascal's estate. "Le chemin de la reine Blanche" links Bezu Saint Eloi to Hebecourt, following the wood side and the river Levriere. This 110 m2 self catering house is located in front of the owners home house, just across the street. 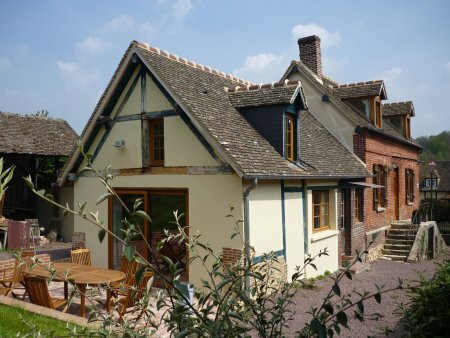 This 19th century old house, made of brick, flint and cob has recently been restaured by Sandrine and Pascal Gravier with old materials to keep it all its charm. Sheets, towels, heating and house cleaning are included in prices. Beds are made at your arrival. A kitchen welcome kit is at your disposal. It includes dish towels, sponges, dish and household cleaning products. 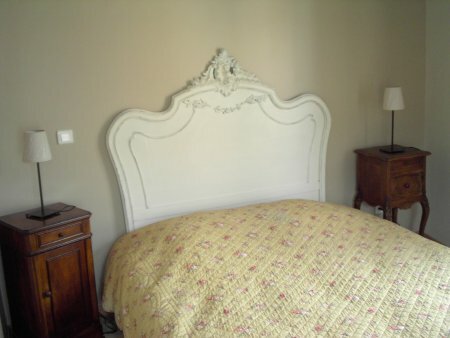 Bed and Breakfast formula with no kitchen facility is also possible at 85 euros per night per room. Your booking is secured at reception of a 25% of the total amount deposit. The deposit is not given back if cancelation occurs less than 30 days before the arrival date. Payment by cheque or by cash. Take the motorway A15 heading towards Cergy Pontoise. After Cergy, follow the N14 towards Rouen, turn right and take the road D947 towards Dieppe. In Gisors, follow the sign"Centre Ville" (town center). Continue straight on. Turn left after the church into the main street (Rue de Vienne). Continue, then turn right at the traffic light, continue till the second traffic light. Then, straight ahead towards St Denis Le Ferment. Drive through the wood for 4 km , after the bridge, turn right. And you will arrive in the village, the house is on your right , 1 km after the entrance sign. It's a house with blue shutters. Drive towards Vernon. 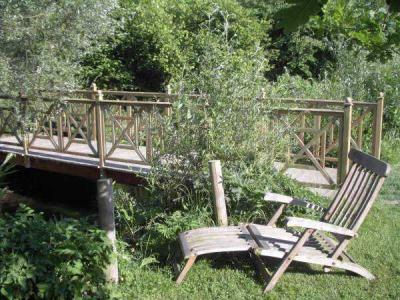 Don't cross the bridge, follow Beauvais, then Gisors. After Les Thilliers en Vexin, go on til the round about. Take left to Bezu St Eloi. After driving for 4 km, turn right at the traffic lamp. In Bezu St Eloi, drive for 500 m, and turn left following St Denis le Ferment. After a 4 km drive you will arrive in the village. The house has blue shutters; it is on your right 1 km after the entrance sign. Closed and covered car park. Living room with antique tiles, exposed beams and fireplace.